Rebecca Miller belongs to the large Old Order Amish community in Holmes County, Ohio. She’s previously shared a week’s diary in the life of an Amish girl, as well as two journals from trips to Niagara Falls and Mackinac Island. Amish people, especially younger folks, often contribute to disaster relief projects via Mennonite Disaster Service or other organizations. Many Amish and Mennonite volunteers have helped rebuild in the aftermath of Hurricane Katrina. 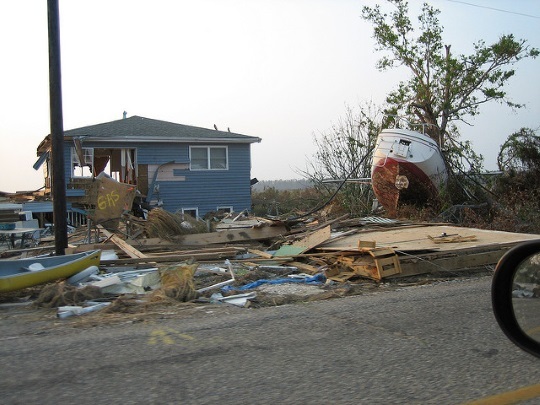 Today Rebecca shares recollections from a week spent in Louisiana in 2008 doing hurricane relief work. Not all Amish are as active in relief efforts, but many are. Besides being a way to help one’s neighbor, Amish know that relief work can be very rewarding. And it’s not only Amish men who contribute to these projects, as you’ll see below. 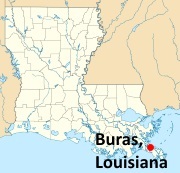 Today we had our meeting about our Louisiana trip. We had it at work, as our boss is sponsoring us. We will need to do a lot of packing. We’re also taking quite a bit of food which the company is donating. We will be leaving Jan. 24th and returning home Feb.2nd. There will be 11 of us. We will be using a church van from Grace and pulling a trailer. Doug, from wholesale, will be doing the driving. Others will be his girlfriend, the Shoups, Dennis Millers, Ella, Elsie, Ruth, Kenny, Betty, and I. All of us have connections to Coblentz Distributing except Dennis who was asked to go along as crew leader, because of his carpentry experience. Les picked us up a bit before noon, then we met the others at the store and got some last-minute stuff together. Yesterday I cut up quite a bit of finger food for us – bologna, cheese, fruit, etc. and we had also gathered snacks and drinks etc. They told us to gather whatever we think we need from the store and just keep a list. It’s all donated by the company. So, although this is not really a vacation, it’s still a paid vacation of sorts. We were all loaded up and headed out by 1:00. We had a fun afternoon playing games and telling stories. We stopped at Cracker Barrel for supper. It’s so nice to have Doug take care of everything. We slept close to Nashville, TN. We need to get up at 6:00. We have 11 more hours to drive. This morning it was 10 degrees in Nashville. B-r-r-r. After breakfast at Shoney’s we headed South through Alabama, Mississippi, and finally into Louisiana. The stretch through AL and MS was boring this time of year. Around 2:00 we started seeing the first hurricane damage. Once we got closer to New Orleans we saw much more damage. Also saw lots of FEMA trailers and mobile homes set up. We found it unbelievable how much debris and piles of brush, etc. were still all around even now, two-and-a-half years after Katrina. We all got tired of driving, after our lunch stop, Doug was like Hammer-down. We didn’t stop all afternoon, so we were really happy when we reached Faith Temple Ministries south of Buras at 5:15. This is the church that is housing the volunteers. The church is a round dome building with about half of it sectioned off for sleeping quarters. The other half is used as a Fellowship/mess hall, then on Sunday the tables are all folded up and it’s the church’s sanctuary. The restrooms, showers, and kitchen are in a separate building. One part of this building is an apartment where a young couple from Mississippi live, Ethan and Natalie. They help with the meals. Ethan also goes along on some of the jobs and is doing on-line college classes. Then there’s Brian and Ester and their 2 kids. I’m not sure where they live, but they’re around most of the time. Brian is in charge of having supplies here and also going after them in New Orleans if needed and finding new properties to work on. There is also a girl living in the back room here. We saw very little of her. I think she is the bookkeeper and helps with the meals. We are right beside the Mississippi River, so it’ll be interesting to watch the boats. There are two van loads of Amish here from northern Indiana and southern Michigan. Three are girls, the rest are all guys. There is also a couple from Indiana who lives here most of the winter overseeing the work and being house parents of sorts, although they have their own home here loaned to them by a sweet older lady named Barb, who lives in a FEMA trailer, while Daves live in her home. She does this out of the gratitude of her heart for all that Dave’s people have done for her. Dave’s wife is such a sweet little lady and although she has health problems, she’s here showing her support for what her husband does. After supper, Ruth and I went over to a neighbor’s yard to help them play volleyball. It was good to get active after all that sitting. It was also a good way to get to know some of our fellow workers better. After breakfast cooked by the Indiana girls we helped with dishes and cleaned restrooms, then headed down the road about a mile and a half. We started painting the upstairs of Earl Hingle’s home. After lunch three of the women stayed to cook supper and do some clean-up. Two of the ladies worked on cleaning the steps and banisters, quite a job, with a lot of dried-up mud on it. We others finished painting upstairs and started downstairs. Doug picked us up and took us down to see where the guys were working on a food pantry/home/church. Then we headed back in time to get cleaned up for supper. After supper they showed us several videos of the hurricane. The first one was merely pictures taken afterward. The second one was an hour-and-a-half in length, that a guy took from on board his tied-down steel shrimp boat. It was quite intense and gave you the real feel of it all. During the eye of the storm the men on the shrimper rescued 2 other men and a dog. Back home it had been hard to imagine all this damage, now you understand it so much better. And these people are so grateful for everything. We took our turn cooking breakfast. After a later breakfast, because it’s Sunday, we cleaned everything away. The guys moved all the tables and got chairs set up in rows for the church services which started at 10:00. They had a baby dedication. The sermon was very inspiring. They could really sing! This was a new experience for us to have an electric guitar and a piano, etc. in church. Pastor Jesse is a Cajun Indian and grew up in the swamps and bayous. He and his sister used to go to school with a boat. After lunch we took a ride down to the end of the road and also visited the largest fishing marina in the world. We saw many interesting birds. I wish I had a bird book so I could identify them and make a list. Then we drove up through Buras and Empire to see the locks and saw a beautiful sunset from the bridge. After supper we sang awhile and played games. Early this morning some of the others went fishing. It’s an absolutely gorgeous day! Sheila and Janet stayed to take care of things here and we went painting again. The people here cook our lunch and supper for us. So far we’ve had rice and beans and beans and rice. I love it, but some of these northerners can hardly eat it anymore. The others had a great day fishing , they caught some huge ones, 30″-35″ long. WOW! After supper we played volleyball. It was lots of fun! These guys keep it lively. We came back earlier because we had to do laundry yet. Today was another nice, sunny day like June back home. We went back to our painting job. We ran out of work so some of them went back earlier. After lunch they decided to take us fishing, because they said there were storms moving in for later in the week. We drove down to Venice to the fishing marina. Preston took us out on Yellow Cotton Bay. We didn’t catch anything worth keeping, but it was well worth it just for the ride. He took us out at 50 MPH and drove along as if we were going down city streets. We saw lots of birds again. It was very windy and the tide was too high for the fish to be biting. I didn’t really care that much, I’m not much for fishing anyway. But the ride was absolutely great! Supper was over till we got back, so I grabbed a granola bar and went to play volleyball. By late evening it was raining. Today several of the ladies went to a different house to paint and the rest of us went to Hingle’s house again. Elsie stayed back to do laundry and cleaning. Tonight some of us went to Port Sulpher for pizza. Then we went back to Dave’s to sing. It was a good evening ! Today is our last day here. It’s hard to believe the week is almost over. In a way I’d like to stay longer. We met a lot of great people and made some new friends, but will be good to see everyone at home again and have more privacy. This forenoon I stayed here and cleaned and did laundry and got some things ready for home. In the afternoon they took us to pick oranges. They were the best! Tree-ripe tangerines right off the tree, never knew they could be so good. And I’ve always loved oranges. We got back before suppertime, so we girls sat out on the levee a while and talked and watched the river traffic. In the evening there was a storm so we couldn’t play volleyball. I had hoped we could one last time. The electric went off, so we played games by the light of flashlights turned upside down and a white plastic glass on top. Everyone is leaving early in the morning. It’s kind of sad to think we might never see each other again. We watched a cruise ship go by. They are pretty impressive all lit up after dark. Today we start home. It’s bittersweet. By the time we got up the others had left except for four of the boys. Steven and Samuel are staying another day or so and going home by train. Leroy and Jason are staying another week, then also going home by train. Pastor Jesse’s Mom said she wants to hide us all so we stay here. Yesterday four young people from N. Indiana arrived. We had a gorgeous day for traveling. We started off around 7:00, after good-byes to the ones who are left. We said our other good-byes last night. We stopped for breakfast in Slidell, and made a few other stops throughout the day. Slept quite a bit, the last few nights I didn’t sleep much. I wasn’t feeling the best, then it seemed I heard every sound and there were a lot, with sleeping in the same building as so many other people and only having housewrap for walls between us. In late afternoon we saw an accident happen, it was in rush hour traffic. We slept in Bowling Green, KY. A few of us went over to Gander Mountain. We made good time traveling on the last homeward stretch. We got back around 4:00. We had a great trip. Met many wonderful people, made new friends and had a lot of great experiences! Now we have lots of memories, some good, some not so good and some unforgettable! We thank Coblentz for making this trip possible for us and God for watching over us and bringing us safely back again. It sure was good to sleep in our own beds again in the peace and quiet of our home. All in all it was a good experience and I feel blessed to have been able to do this. Thank-you, Rebecca, for sharing this part of your life with us. I am sure it was as much of a blessing to you as it was to the people you helped. Thank you Rebecca for sharing your mission trip with us. Reading your journal brought back a lot of memories from my own mission trip. Yes you miss the people you met but they are still a part of us. Bless you for sharing your time with those less fortunate. I have known a lot of people who have helped with MDS, and MCC. We never have to look far, to see people who are in need. There is nothing as rewarding to me, than to be able to help others. I wish that I had helped MDS when I was younger, as I am too old now. I can volunteer at my local hospital gift shop, though, and I enjoy that & I am appreciated there for the time spent each week!! Blessings to all those who take time to volunteer…U are a blessing to many! Rebecca – I have lived all my life in Louisiana; many thanks to you and your group for coming to help. The best thing – by far – about Katrina was the wonderfully generous response from so many people. We met people from all over the world who came to help. I’m sure the scenery and culture were somewhat exotic for you- we’re a little different around here. And I’m so glad you got a taste of our DELICIOUS oranges! Thank you so much! Oh, Rebecca, I love reading your adventures. You all are so good to go and help with the disasters. I live in Oklahoma, and we have tornadoes at times that are disastrous, and it is really amazing how people band together to help each other. You have a really nice way with words. Eric, thanks so much for highlighting the work of MDS. My husband (who is not Amish) has worked on crews here in Texas. They’re an awesome organization and many people do not realize that the Amish volunteer in this way. My new release, Joshua’s Mission, details this very thing (though in a fictional setting). Thanks again. There is also a new program that has been started for our service- age young men, called OASP ( Ohio Old-order Amish Service Program) . They will get together groups of 20 or more young men with several couples (as house parents) and sometimes single ladies and widows (as cooks). They will usually set up and stay at one location for a month. Also individual groups will go on clean-ups on their own. There is also a great need around us, consider volunteering at your local nursing home , many of the residents would be thrilled to just have someone stop in and visit, read, or sing with them. Or at a local hospital, or thrift stores, or food pantry or homeless shelter. Sometime perhaps I’ll share with you my experiences at Galilean Children’s Home. If anyone is interested they are on Facebook.